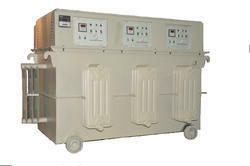 Prominent & Leading Manufacturer from Ghaziabad, we offer 3 phase oil cooled servo voltage stabilizer, three phase air cooled servo voltage stabilizer, air cooled servo stabilizer, single phase oil cooled servo stabilizer, three phase servo voltage stabilizer and linear type servo voltage stabilizer. 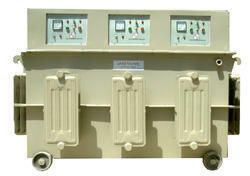 Our range of offered products is inclusive of premium quality 3 Phase Oil Cooled Servo Stabilizer. These are manufactured using raw materials that are carefully sourced from leading vendors of the market. These are used to prevent electrical appliances from getting damaged during power and voltage fluctuations. These stabilizers are available to clients in multiple specifications at leading market prices. These are commonly used to facilitate the continuous efficient functioning of an appliance during a power failure. Keeping the track of latest happening in this domain, we have been able to manufacture the optimum quality of Three Phase Air Cooled Servo Stabilizer. Known for its compact design and less power consumption, the offered stabilizer is used for regulating voltage. 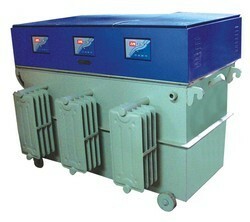 Quality of the offered three phase air cooled servo stabilizer is never compromised at our end. We manufacture our products in accordance with the industry standards so as to keep them at par in excellence to international quality. Air Cooled Servo Stabilizer finds tremendous usage in various industries to protect from the varying voltage. The fluctuation in the voltage at times result in the breakdown of the appliance. In the AC voltage supply at various instances the voltage waveform gets distorted due to noise or sometimes the voltage exceeds the thresh hold value. Using this stabilizer helps in providing the constant voltage to the appliance. These are specially designed using the advanced technology. Due to this, they provide optimum current to the appliance at the constant voltage. This also improves the performance of the appliance. Apart from this, they provide protection against the unusual voltage and voltage spikes by providing constant waveform at the output. Cherished as a reliable manufacturer and supplier, we are engaged in offering the optimum quality of Single Phase Oil Cooled Servo Stabilizer. Owing to its overload protection, compact design, and energy efficient construction, the offered single phase voltage stabilizer is highly demanded. To meet the precise needs of our clients, the offered phase voltage stabilizer is rendered by us in various specifications. Our range of offered products is inclusive of premium quality Oil Cooled Servo Voltage Stabilizer 3 Phase. These are manufactured using raw materials that are carefully sourced from leading vendors of the market. These are used to prevent electrical appliances from getting damaged during power and voltage fluctuations. These stabilizers are available to clients in multiple specifications at leading market prices. These are commonly used to facilitate the continuous efficient functioning of an appliance during a power failure. Owing to our expertise, we are involved in the manufacture and supply of premium quality servo link Servo Voltage Stabilizer Three Phase. These are manufactured in adherence to the existing industrial quality standards keeping in mind the client’s furnished specifications. These help an appliance to function efficiently even during times of power failure or voltage fluctuation. These stabilizers are available to clients at leading market prices through our excellent supply network. Fast Correction rate and very high efficiency. Works over a wide input frequency range and no waveform distortion. Specially designed high-performance I.C. based control circuit for ultra-high reliability. Auto / Manual operation facility. Over voltage and under voltage indicators. Output voltage adjustability provided on the panel. All components used are of reputed makes conforming to relevant BiS standards. Easy accessibility from all four sides. Plug-in type glass-epoxy control cards for easy on line serviceability. 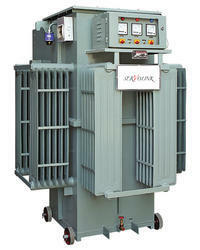 We are offering a comprehensive range of Linear Type Servo Voltage Stabilizer. These are manufactured in strict compliance with international technology to ensure high functionality. The main disadvantage of the AC voltage supply is that at times it is accompanied with the voltage variation, rise in the voltage, dip in the voltage and voltage spikes. The stabilizers are employed in order to counter these effects. 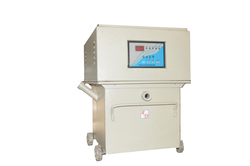 These devices are widely used in order to provide the voltage at the output. This helps in protecting the appliances from the voltage fluctuations. This eventually results in the better performance and improved life of the appliances. 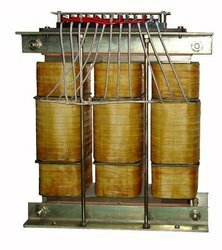 Isolation Transformer offered provides for low noise and low loss working performance as well as comes backed by CE, ISO and other certifications. With an innovative approach, we are suitably engaged as a potential AC Voltage Stabilizer manufacturers, suppliers exporters. We manufacture our products in sync with the international technology to ensure better performance high functionality. 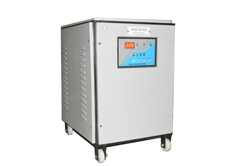 AC Voltage Stabilizer is a widely used device. Its main function is to provide a constant voltage to the appliances like television sets, refrigerators and various other home appliances. It comprises of adaptors, capacitors, diodes and various other components. It helps in protecting the appliances from the voltage spikes. It works in between the prescribed voltage limits. The upper lower threshold voltage of these devices is predefined. Thus, it helps in providing the constant voltage to the appliance. This helps in providing better performance and durability to the appliance. This also helps in protecting appliances from the unusual voltage spikes, distorted waveforms, and grounded voltage spikes. Backed by the team of highly qualified engineers, we equip our products with cutting edge technology. This helps us in meeting the challenging demands of the industry. Our excellent quality products will offer accurate and precise operation. These are best to protect your electrical appliances from voltage fluctuation. 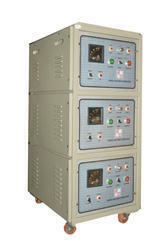 We are specialist Digital Voltage Stabilizer Manufacturers, suppliers and exporters from Delhi, India. We are offering these in several specifications so as to excellently serve the clients. Our products will perfectly give safety security to your appliances from voltage fluctuations.Our expert professionals use graded components, coils, and other things while manufacturing our products. In addition to this, our team precisely engineers our products using cutting edge technology to ensure accurate reliable operating.Being ISO Certified Company, we also test our products at various stages of development to ensure high functionality. These are widely used to counter the effect of voltage fluctuations. Sometimes, rise or dip in the voltage level results in the breakdown of the costly appliances. Thus, these devices are used to ensure that fluctuation in the voltage supply doesn’t affect the performance of the appliance.These are based on the advanced technology. The microprocessor based technology is used along with the advanced circuitry of power electronics. This ensures that these run on lower power. Some of the notable attributes of these are the excellent performance, highly accurate and durable. These find tremendous usage in the various industries. 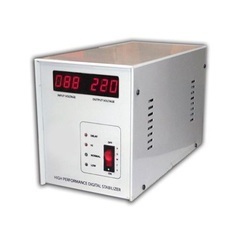 We are globally recognized as a leading Servo Voltage Stabilizer manufacturers and exporters. Having vast experience in manufacturing and supplying heavy duty electrical products, we believe in serving our clients with excellent quality products. These are widely used voltage regulators. 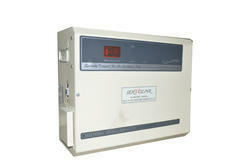 These Servo Controlled Voltage Stabilizers are employed in order to protect the appliances from voltage fluctuations. At times, the variation in the voltage results in the breakdown of the appliance. So, these devices are used. The output obtained from these devices is the controlled voltage. Or we can say that these devices provide the voltage at a predefined value, nor below it nor exceeding its limit. These are specially manufactured using precise engineering in order to offer accurate performance and low power losses. We have used premium grade raw materials along with advanced technology while manufacturing our products to ensure high operational performance.